First discovered in Rising Star cave in South Africa in 2013, Homo naledi is a new species of early human that has upended our understanding of the human family tree. From its morphology to its age and location, almost everything about Homo naledi was a game changer in human evolution. Now, research on its brain structure is adding more pieces to the puzzle. Homo naledi is a species of small early human, which is known to have lived in South Africa between 226,000 and 335,000 years ago. So far, bones have only been found in Rising Star cave, but the remains found there have been exceptional. The first excavation in 2013 recovered over 1500 bones, from at least 15 separate bodies. All the major skeletal parts, and individuals of both sexes and all ages were found. In a discipline where species can be defined on a single bone, this number and quality of finds is of incredible importance. At first glance, Homo naledi may seem quite a primitive species. The body is small in stature, and the brain is tiny at a mere 560 cm3. The overall body shape is reminiscent of early hominins such as australopithecines, and the finger bones are curved, showing adaptations for climbing. However, other traits are strikingly modern. The foot, and the rest of the hand bones are comparable to modern humans. Outside of that tiny brain, the head and jaws are comparable to other Homo species. 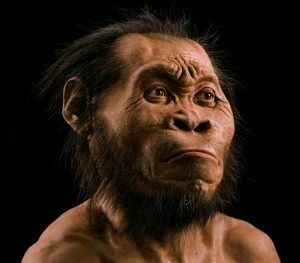 Homo naledi, with its unique combination of traits, and unknown place on the family tree challenges what we mean by terms like primitive and modern. It is also remarkably young. When first announced there was speculation that Homo naledi would perhaps form some sort of missing link between early hominin and human characteristics. However, publication of dates from the bones and sediments in 2017 put an end to that. Homo naledi was living in South Africa just two hundred thousand years ago – at the same time as a group identified as archaic Homo sapiens (or possibly their immediate ancestors) were living in Morocco. Homo naledi was not just a cousin of humanity, but a neighbor. Brains – is bigger better? The human brain is considered one of the markers that makes us unique as a species among other hominins. The large size and complex structure of the Homo sapiens brain is credited with providing our ability to survive environmental change, and ultimately become the world dominating species we are today. Large brains are a potential evolutionary advantage as they can store a lot of information in a series of complex and highly interconnected neural structures. Essentially, they allow us to think more complex thoughts, which in turn allows a greater degree of adaptability in our response to environmental changes and stressors. They also provide for a greater range of social interactions, tool use and environmental exploitation. On the other hand, most animals survive just fine with a relatively small brain for their body size. That’s because big brains are a major investment. They take energy to grow and keep running, which means the young of big brained species have high calorie needs and smaller bodies. That puts demands on food gathering, and makes young humans vulnerable to attack and predation. Giving birth to a big brained baby also puts mother and child at higher risk of birth complications. They therefore need a distinct evolutionary advantage to be sustained. Enlargement of the brain is seen throughout human evolution. Early australopithecines had brain sizes similar to modern apes, although with slightly different structures. Small increases were seen in Homo habilis and the early Homo erectus, along with the expansion of the brain case over the jaw and ear. By the time of early Homo sapiens, the brain size was within the average of today while Neanderthals exceeded that average. However, size isn’t everything, and brain structure is equally important for function. Modern human brains are globular in shape. Compared to the brains of extinct Homo species and early H. sapiens, they are shorter from front to back, but higher from top to bottom. This gives larger areas in the frontal and parietal lobes (the front and top of the brain), and larger cerebellar hemispheres. 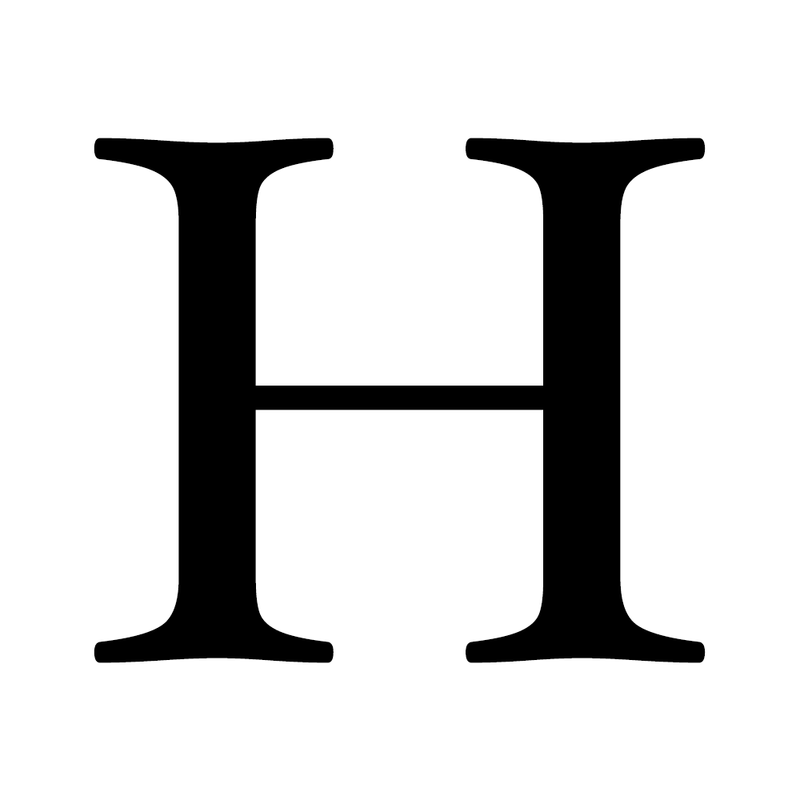 The modern extreme of this form distinguishes living humans from our fossil human ancestors, and is thought to have evolved between 100,000 – 35,000 years ago. Similarly, the structure of the Neanderthal brain is distinctive compared to Homo sapiens, and has even been implicated (although by no means conclusively) in their extinction. Where does all this leave small-brained Homo naledi? The evolution of the hominin brain has previously been presented as a relatively straight line from small to large, with an exception for Homo floresiensis, the Flores “hobbit”. The origins and evolution of that species are still debated, and it is unknown at this stage if it represents a species from a small brained lineage, or an example of island dwarfing from the larger Homo erectus. However, Homo naledi, living in mainland S. Africa, clearly isn’t a result of island dwarfism. What does new research say about its brain in relation to other Homo species, and does it throw light on how and why our brain structure evolved? How to measure a brain? Brains, being made of soft tissue, don’t fossilize, so scientists have to base their understanding of early brains on the skull. Fortunately, because the skull and brain develop in tandem, even an empty skull can provide significant information about brain size and structure. This is because the brain leaves an imprint on the inner surface of the skull, called an endocast. Therefore, by using advanced techniques like CT scanning and 3d printing, it is possible to reconstruct the outer surface of the missing brain. 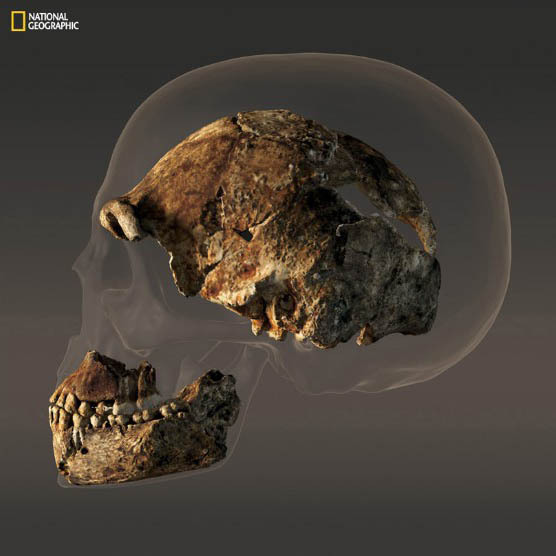 The brain of Homo naledi – small but advanced? 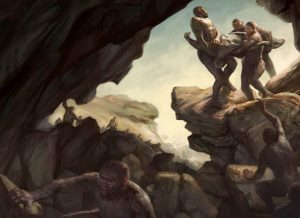 In 2018, the first research into Homo naledi’s endocast was published. At least five partial adult skulls were found in the 2013 excavation, providing scientists with a good opportunity to reconstruct the outer morphology of the brain, as well as the skull itself. The skull of Homo naledi is a mixed bag of features, with a size similar to Australopithecines, but physical traits seen in Homo habilis and Homo erectus. The endocast proved to be similarly mixed. One of the big structural differences between the brains of apes and humans is in the structure of the frontal lobes. Apes have a structure called the frontal-orbital sulcus, while the larger and more developed frontal lobes in humans result in what are known as frontal opercula. In fossil hominins, at least some australopithecines are known to have a frontal-orbital sulcus, grouping them with apes on this area of brain structure. Unfortunately, detail of the area is absent on many early Homo fossils, but frontal opercula are seen in some Homo erectus and Neanderthal skulls. Homo naledi’s endocast showed clear evidence of frontal opercula, and no frontal-orbital sulcus. Therefore, while its brain size groups with apes and australopithecines, its brain structure places Homo naledi firmly into the early human camp, with all the associated implications for social and tool using behaviors. One question that has yet to be resolved is whether Homo naledi is a late survival of an early hominin form, which would make its characteristics ancestral to other Homo species, or whether it is an evolutionary reversal, where a small brain size and adaptations for climbing were selected for at a late stage, from a larger brained ancestor. That question is important, because it has implications for how our brains evolved. If Homo naledi’s brain is ancestral for Homo, then it shows that many of our key evolutions in brain structure occurred before the increase in brain size – and that has implications for what matters in brain morphology and evolution, and ultimately behavior. To resolve that issue, more samples from more sites and dates are needed, but at least the discovery of Homo naledi shows that such things are likely to be out there to be found. For all the questions still to be answered, examination of Homo naledi’s brain has shown one thing clearly – these fossils once again prove that human evolution is a more complex web than previously believed. As more excavations take place in Rising Star cave, it is likely that this amazing South African site will be changing how we think of early humans for some time to come. From its morphology to its age and location, almost everything about Homo naledi was a game changer in human evolution. Now, research on its brain structure is adding more pieces to the puzzle.